The 2017 edition of the Percival Plinth Project has arrived. 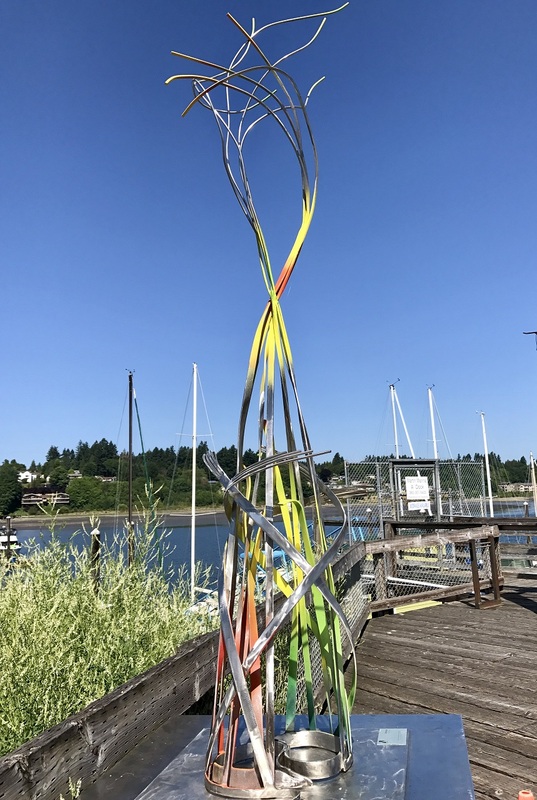 Each year, the plinths along Percival Landing – permanent cube shaped bases for sculptures – receive new sculptures for public enjoyment. 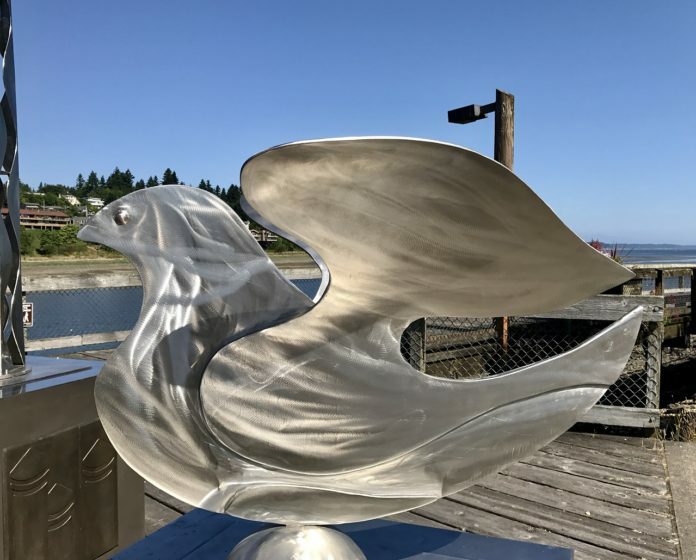 Now through July 31, voting is open to select the winner of this year’s People’s Prize which will be purchased by The City of Olympia and given a home elsewhere in the city for permanent display. 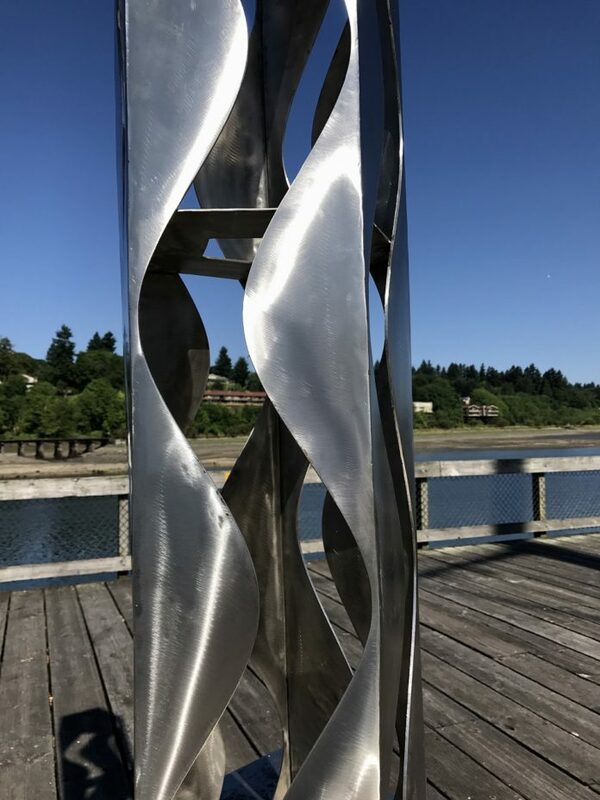 Fifteen artists are vying for the top prize this year, working in mediums ranging from steel to bronze, glass to alder, sandstone to salvaged materials. 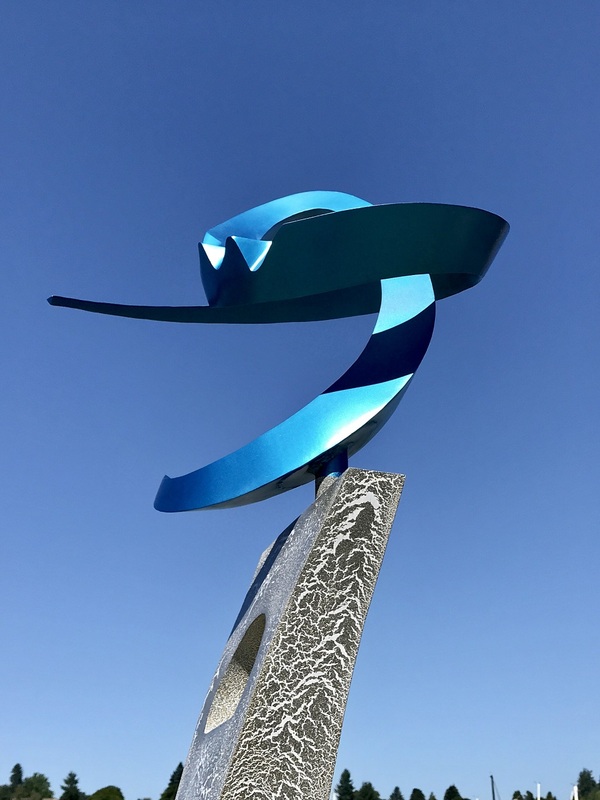 This year’s sculptures come in a variety of sizes and attitudes and are not to be missed. 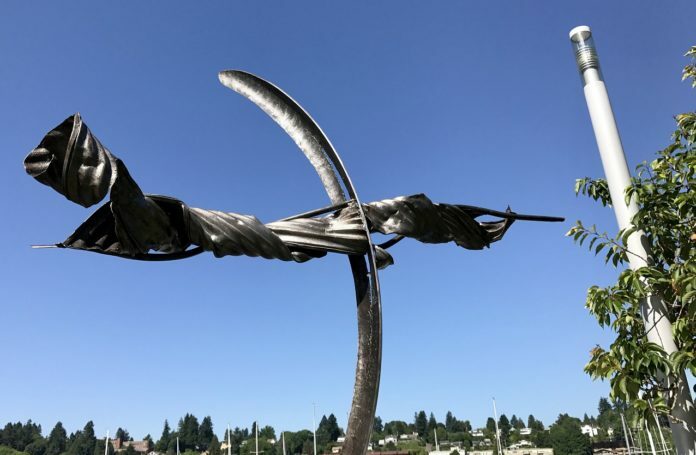 You can check out additional information about the Plinth Project via the City of Olympia’s website. You can also pick up ballets along the way, (I found mine near “Wounds of Time”). 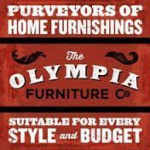 The Percival Plinth Project speaks to the creativity, beauty and community values that tie us all together. Armed with fresh treats from the Farmer’s Market and hot coffee from the Dancing Goats Café, I walked this year’s entries from No. 15 to No. 1 and what I saw was nothing less than extraordinary. Jesse Swickard began his career in childhood, working at his father’s machine shop. He later went on to study welding formally. Over time, he began mixing welding with paint, making furniture out of snowboards and nurturing his creative spirit. “Most of my art I create is nature based and built to withstand many years and outlast many lifetimes,” shared Swickard. 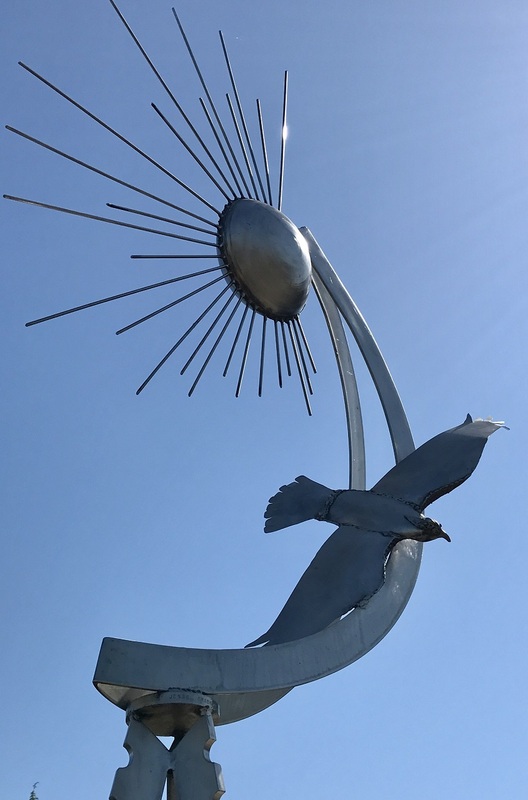 His piece, “Growing II” stands tall, blending seamlessly into the skyline, the bird’s detailing giving the statue life and depth. A perfect partnership between the cold elements of industrial society and the living species trying to thrive among us. Ken Turner’s statue, “Embrace”, is a delight to the eyes and mind. Delicate metal ribbons seem to dance before you, each of different size and color and shape, all mingling in calm harmony. Louise works in cast bronze, forming the original sculpture in wax, a pliable medium that allows for energy, movement and life to enter the sculpture. 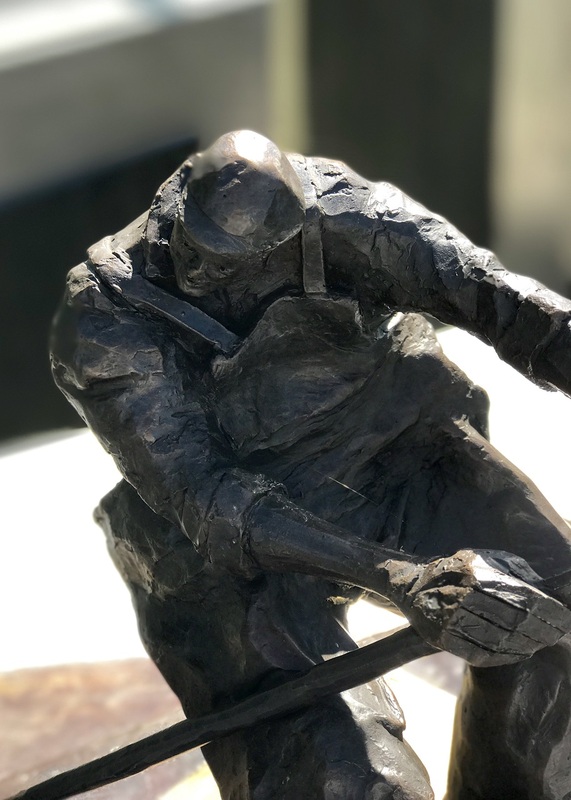 “Doryman” portrays something raw and honest, a man worn but not weary, fish nipping at his heels, a tribute to the undefeatable spirit. “Earthsound” is a beautiful caricature of life. You find yourself compelled by the young woman – delicate, trusting, barefoot – and the careful, nurturing way she holds her palm to the earth, truly listening. 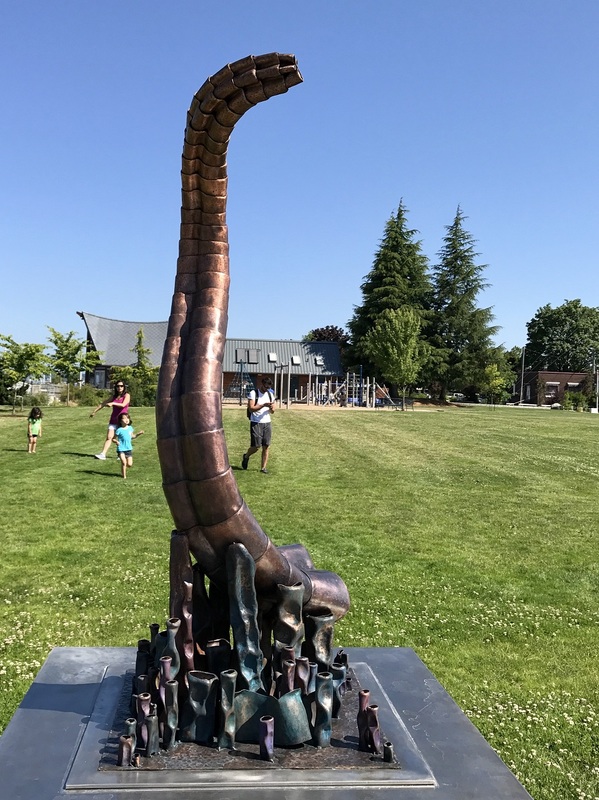 Artist, Jon Kalin, intended for “Earthsound” to be a life-sized sculpture, but after finishing the maquette decided he wanted to preserve it just as it was. Karsten Boysen crafted “Diana’s Quiver” out of salvaged materials. 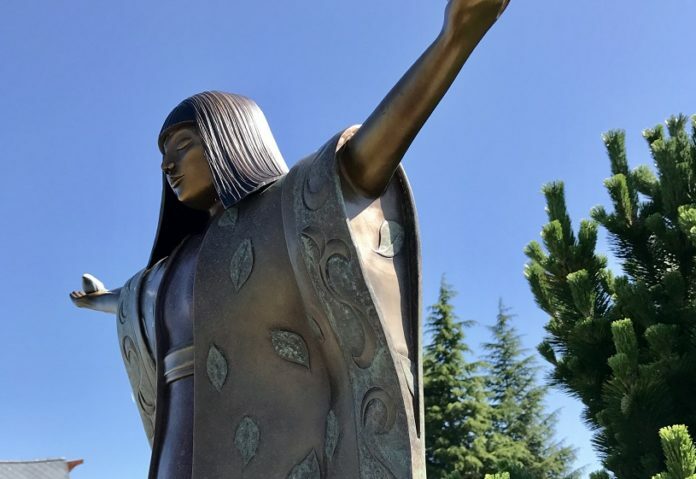 From pieces lost, forgotten, or discarded rose a statue of magnificent size and power. Each piece appearing war torn and mangled, but somehow all the stronger for it. It leaves one with the feeling of power and possibility. A wonderful example of how recycling and reuse are more than good practice but also the means to a beautiful world. A small woman stands quietly on the pier, a watcher of the water. Her arms extended in gentle welcome, small birds resting in her palms. Every detail she wears, intricate and meaningful. 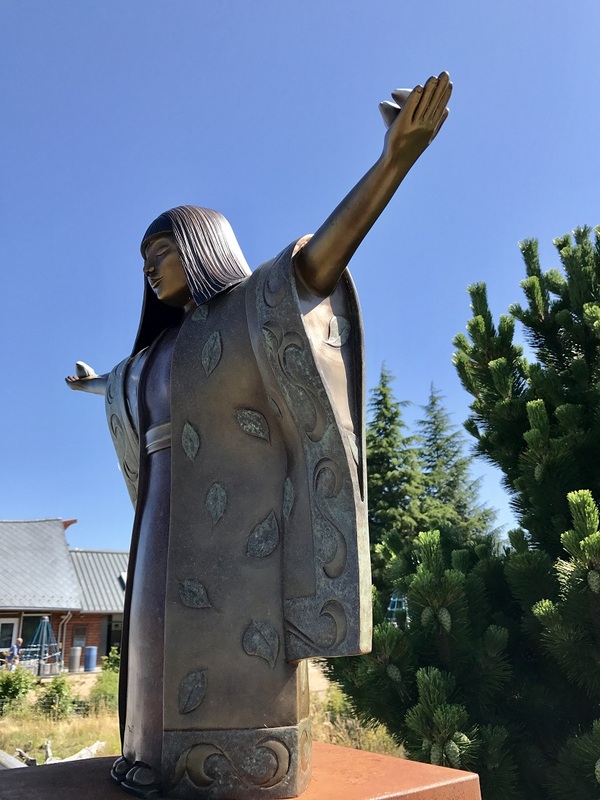 Formed from pottery clay and immortalized in bronze, Ann Fleming’s statue, “Midori Spring”, is a lovely combination simple grace. It serves as a reminder of the simple beauty and harmony that exist between us, if we just take the time to pay attention. At first glance, the sheer height of “Wounds of Time” will catch your eye. But at closer inspection, you will note the absent pieces, each of different size and depth, remnants of a story. They reminded me of the struggles and losses we often face in life and the fact that we can still overcome and stand tall in the end. In “Wounds of Time”, Grant Walker hopes to inspire a conversation about our scarce resources. 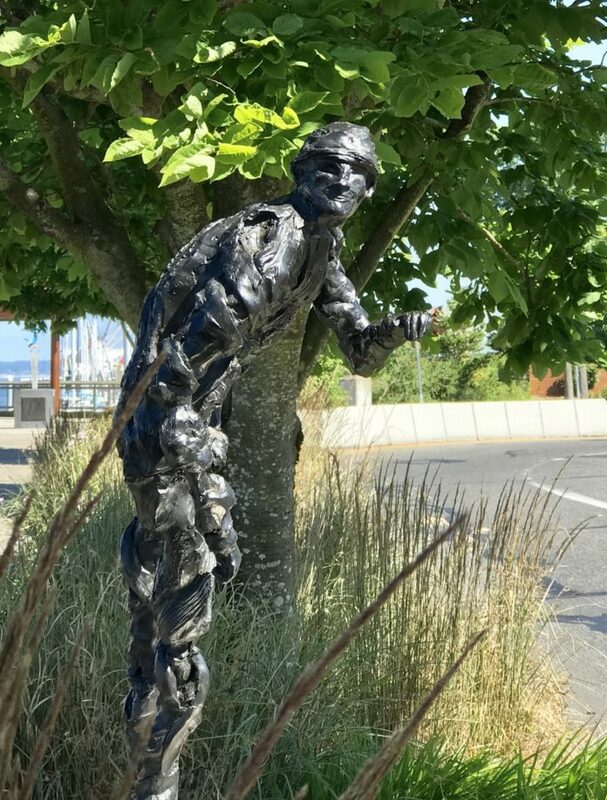 His statue reflects the life of a tree – burned, decayed, wounded – sometimes by nature and often through human action. “Wounds of Time” presents an opportunity to reflect on our actions and interactions with nature. Leon White has been creating artwork since he could hold a crayon. Whether painting or sculpting, he knows that an artist must create every day to grow and gain needed experience. 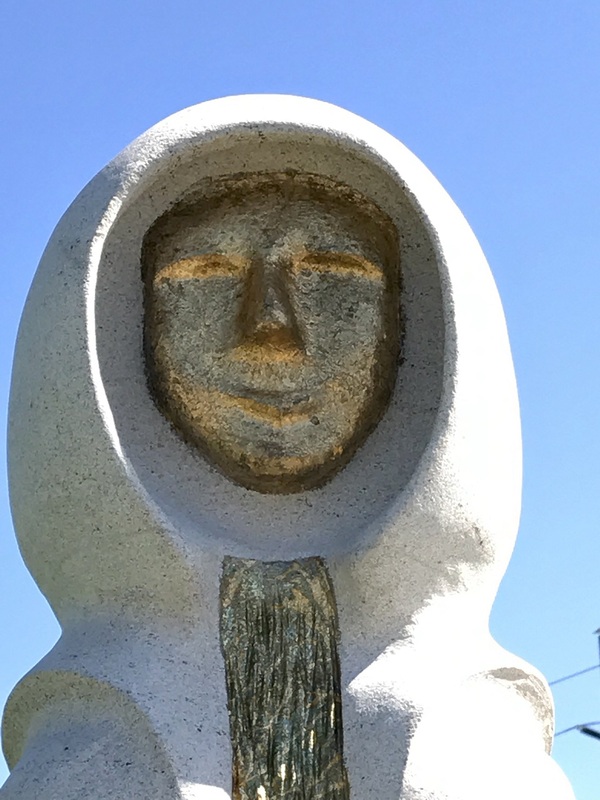 The sandstone used for his entry, “The Wisdom Seeker”, came from the local Tenino Quarry. This gentle spirit figure has been carved with simple clean lines and easy folds. Under his hood, a small smile that makes you feel as if he really does know something you don’t. “Fossil II” is the creative product of a dynamic team. 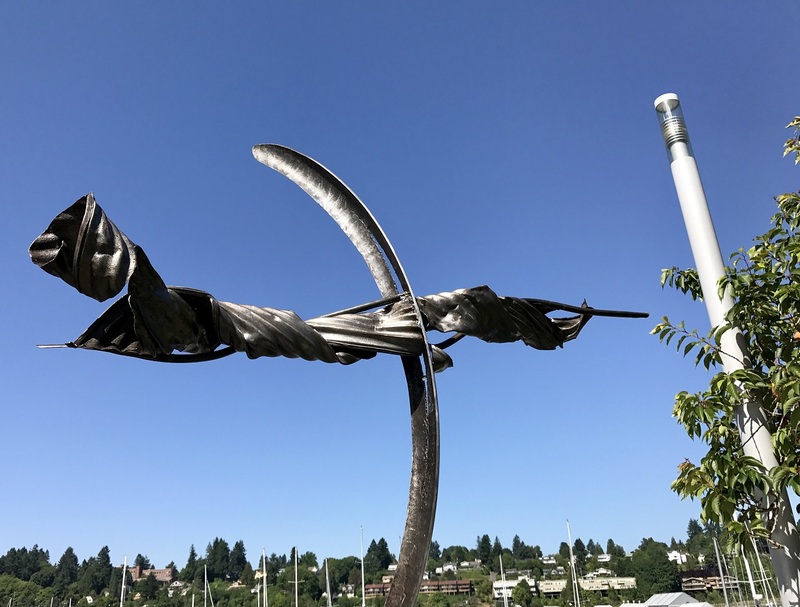 Lin McJunkin, science educator and artist, and Milo White, whose attention has moved from fabricating large commercial buildings, and even ships, to smaller, more personal sculpture forms. “Fossil II” sits close to the water, the sun dancing off each brilliantly colored pane of glass, a wave of DNA and a reminder of both the strength and vulnerability of every living form. Kevin Au’s entry, “Sentry”, exudes both a clean and technical feel. It is a piece of rich color, bold lines and solid craftsmanship. Careful placement of texturing on the base gives the medium a softer feel and at close inspection, almost mimics the lines of the mountains in the distance. Something about the way Au molded the crowning piece gives you a sense that atop that mountain a power force is waiting and watching, but I wonder what he is waiting for? Artist Timm Duffy shows his love for mysticism with his entry, “Stargazer”. Duffy’s statue seems to have risen from the medium on its own, its lines fluid and raw. 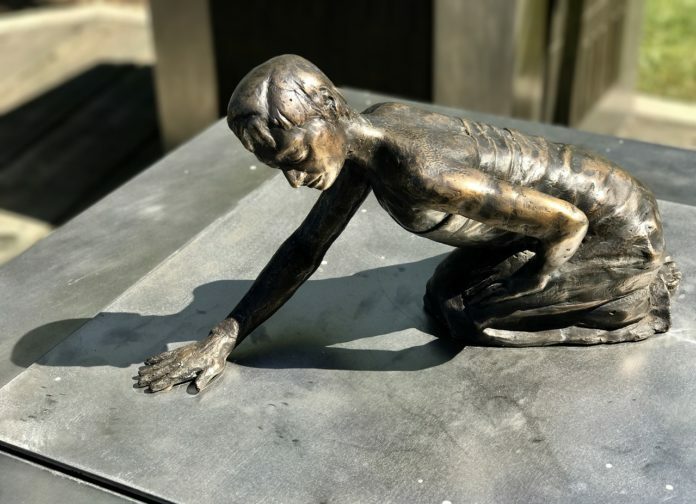 The physical nature of “Stargazer” is hardly permanent, despite the attempt to cast him in bronze. You get the sense that this small man sees something your forgot to pay attention to and that he has the means to walk from his platform to seek it. The feeling of movement and change and possibility all combine to create a feeling of unexpected magic and satisfaction. Lance Carleton’s entry, “Fat Tire #2”, is unique in that it is made for play. “Fat Tire #2” is built from salvaged materials, each with a story that serves Carleton as his windows to inspiration. 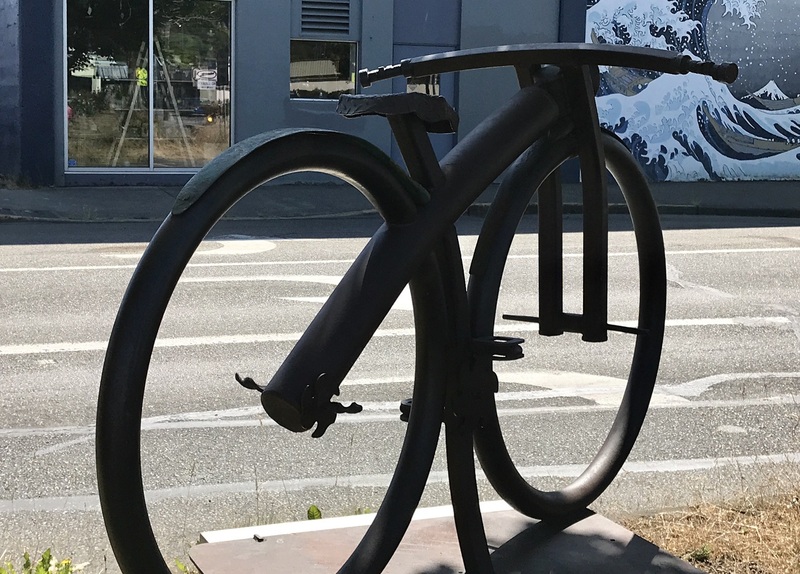 It’s an easy and fun fit for a community that values the environment and supports bicycle transportation. Charles Fitzgerald began his career as an illustrator for Boeing, moving on to teach high school art for 23 years. Along with life experiences, he finds inspiration and creative fuel from nature and the isolation of detailed shapes and forms. “The materials I use are determined by where they will be placed. 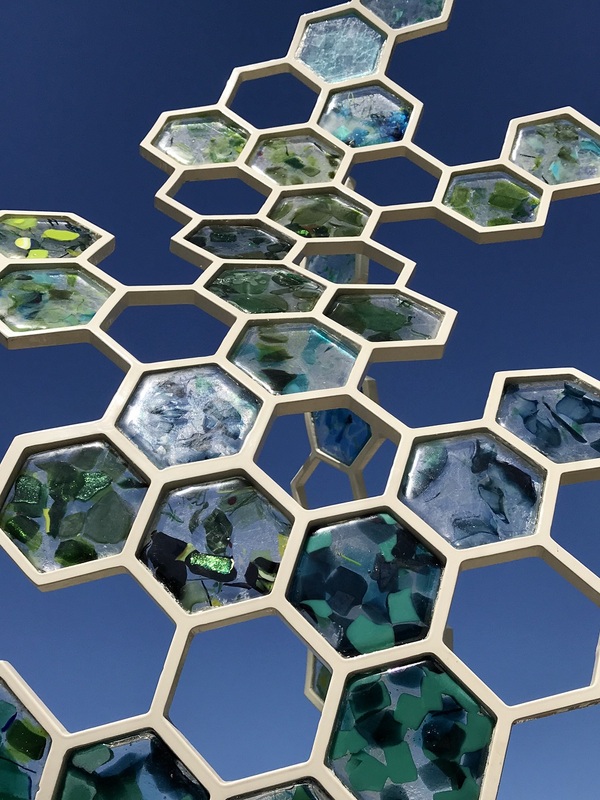 Public art must be able to sustain the elements and human destruction. 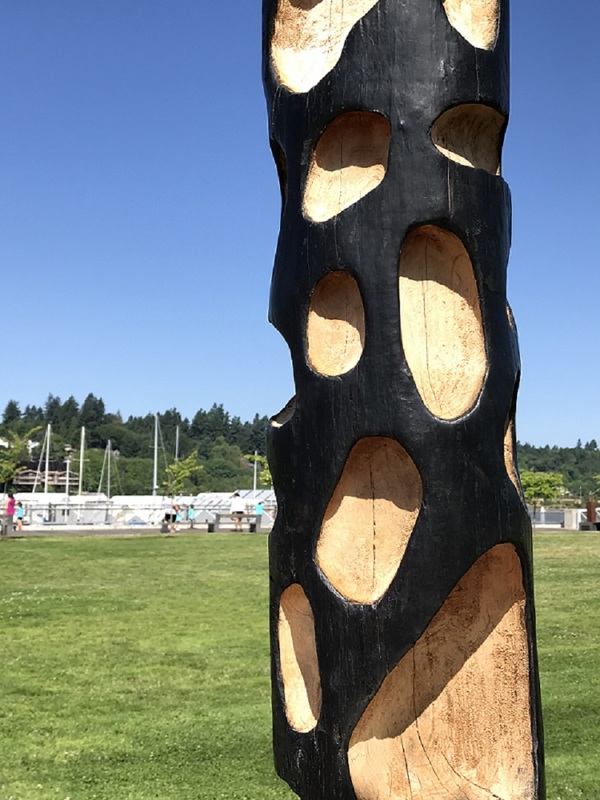 The man-made qualities of stainless steel and the magic of old growth cedar have the most meaning to me,” he explained. Fitzgerald’s entry, “Peace Dove”, evolved through biblical symbolism and his wish for more peace in the world. You will find it quietly sitting on the pier, constructed in such a way you may be reminded of the delicacy of a pearl but also the strength that comes with hope. “Ribbon” is both grand and powerful, like the sea, reminiscent of waves of great magnitude equally awe inspiring and delicate. Sound, rhythm and light play off its stainless steel. Rodger Squirrell crafted his entry through the salvage of materials left for waste after his commission of another project.